Q: I attempt to convert some Office files to Flash magazine with Page Turning Pro for Office, but I also want to keep the flip book private. Can I set password to protect my page turning book? A: Yes, both Page Turning Pro for Office and Page Turning for Office allow user to set password to avoid unauthorized access. When you are design a Flash page turn book with Page Turning Pro for Office or Page Turning for Office, you can choose whether to secure the generated flip book or not based on per need. It is simple to set password for your page turning book. 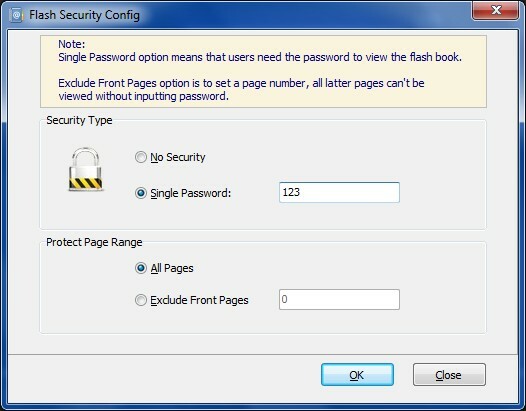 When you are design your own book, select “Option --> Flash Security” in menu bar, then enter password in Security Config box, you can also select to protect all pages or part of pages.